In the center of Manhattan Island lies a great expanse of sculpted nature. This large swath of greenery—Central Park—was the first great manifesto of a new urban vision that sought to introduce nature into the heart of commercial and industrial cities in the United States. As a measure of its tremendous success, the park quickly and enduringly became one of the most popular public attractions in New York City and an icon of a metropolis often famed more for its commercial power than for its art. The second crucial factor, by the middle of the nineteenth century, was the widespread awareness that industrial cities needed to be carefully planned. Reformers such as the poet and newspaper editor William Cullen Bryant and the travel writer, horticulturalist, and co-designer of Central Park, Frederick Law Olmsted embraced the urban future, but they wanted to better the lives of all city dwellers by introducing nature as an antidote to what they saw as the unsafe and unsanitary qualities of large cities. Of course, these reformers knew that true rustic nature was impossible in the middle of cities. Instead, they sought to cultivate a man-made, pastoral landscape that captured the best qualities of nature as filtered through human invention and design. 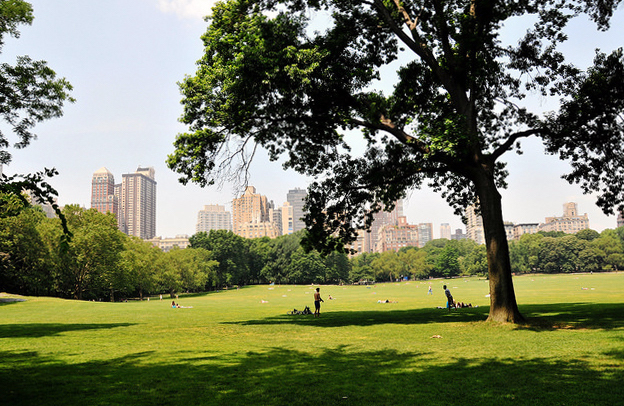 Large parks were to be “the lungs of the city.” The reformers professed a Romantic conviction that being surrounded by nature assuaged the nerves and mind and helped “unbend” certain physical and psychological tensions. Some reformers, though, expressed their views in a more paternalistic manner, showing disdain toward the poor and working classes. They argued that Central Park’s bucolic scenery should serve as a setting to refine the coarse, impolite manners thought to characterize especially the new, often impoverished immigrants then found in large cities like New York. Olmsted himself wrote that “a large part of the people of New York are ignorant” of a park’s social purpose and needed “to be trained in the proper use of it.” Olmsted’s original objective was to direct visitors to stroll through Central Park and quietly admire the natural scenery; they were not to partake, as they often do today, in strenuous exercise, large festivals or concerts, or any other behavior that would disturb the park’s bucolic ambience. Early on, he and his design partner Calvert Vaux issued regulations to achieve the desired behavior among park visitors: a polite sociability that might then filter out into behavior in the city itself. These social concerns relied on the aesthetics of the natural landscape pioneered earlier in England. The “English landscape gardens” of the eighteenth century, as well as the early nineteenth-century suburban cemeteries of Paris, especially Père-Lachaise, strongly influenced landscape design in the United States. 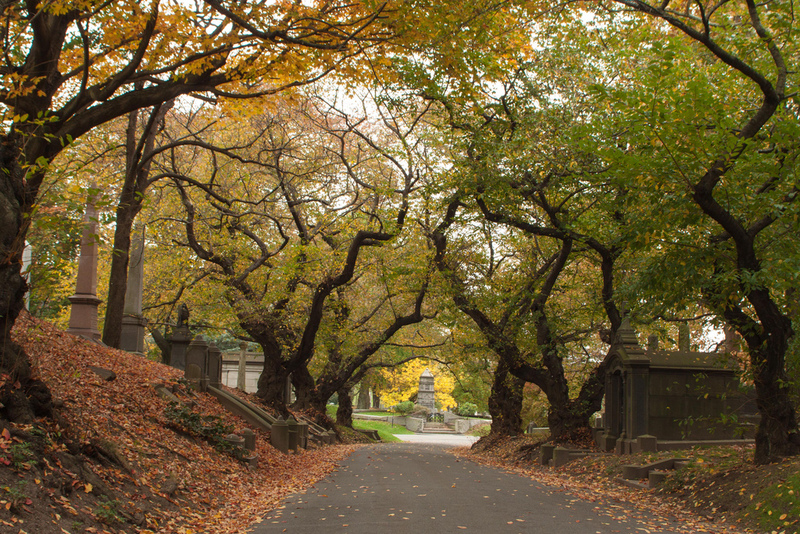 In the 1830s, for example, the Rural Cemetery Movement produced important landscape designs including Mount Auburn in Cambridge, Massachusetts, Green-Wood in Brooklyn (below), and Laurel Hill in Philadelphia. These suburban cemeteries were intended to provide a quiet retreat and confer physical and mental health benefits on visitors. They were designed according to the aesthetics of the English landscape garden (above), in which winding paths, open meadows, ponds, and occasional architectural “follies” created picturesque effects very different from the rigidly symmetrical or geometrical layouts of gardens in the Italian and French traditions, such as the Boboli Gardens in Florence or the royal gardens at Versailles. 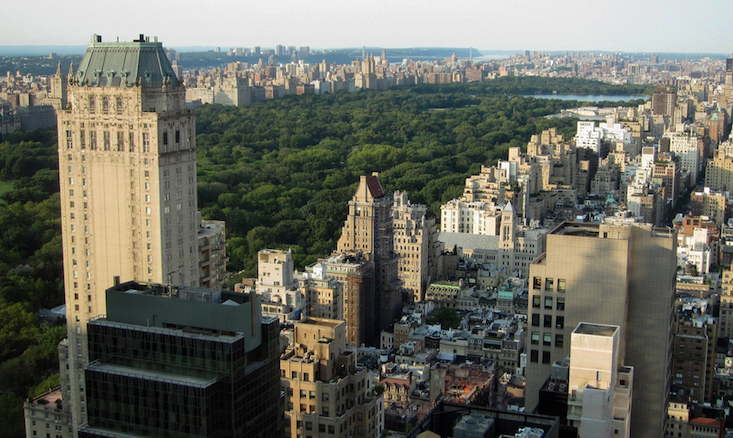 Political support was the third major factor in Central Park’s development. The land acquired for the park had been included in the city’s gridded urban plan of 1811, which was an early effort to take control of Manhattan Island’s development. The area was treeless, rocky terrain. On the west side it encompassed a small settlement that counted 264 residents in the 1855 census. About half of the modest houses in “Seneca Village,” as it was known, were owned by free African Americans, along with many German and Irish immigrants. There were at least two churches, cemeteries, and a school. 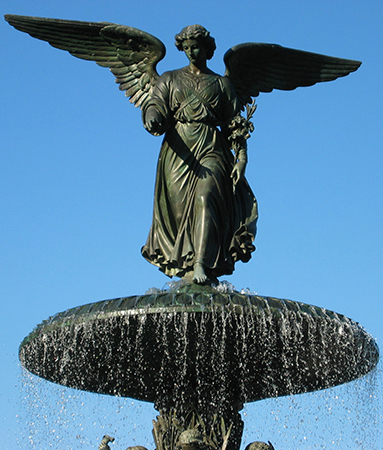 City and state government used the legal power of eminent domain to claim the land as part of Central Park, forcibly evicting all the residents by 1857. New York engineer Egbert Viele—who was responsible for the first, unbuilt plan for Central Park in 1856—described the land as a “pestilential spot” with “miasmatic odors” emanating from the untended ground. Unhealthy and unsightly, the land was ripe for reform as projections for Manhattan’s future growth pushed the boundary of built-up land further and further north. Reformers and politicians also soon realized that the 1811 plan had not sufficiently taken account of the need for recreational and other types of open space. Even the few parks provided by that plan had mostly been built over in the intervening decades as real estate interests trumped the public good. 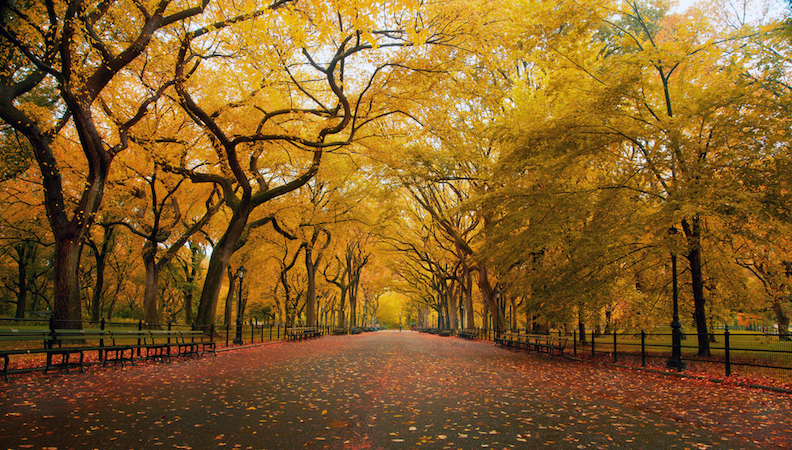 In 1853, after more than a decade of agitation by Bryant, landscape architect Andrew Jackson Downing, and others, the state of New York authorized the creation of a large park in Manhattan, originally to be built and designed by Viele. However, his design was considered perfunctory, offering little in the way of artistry or ingenuity. 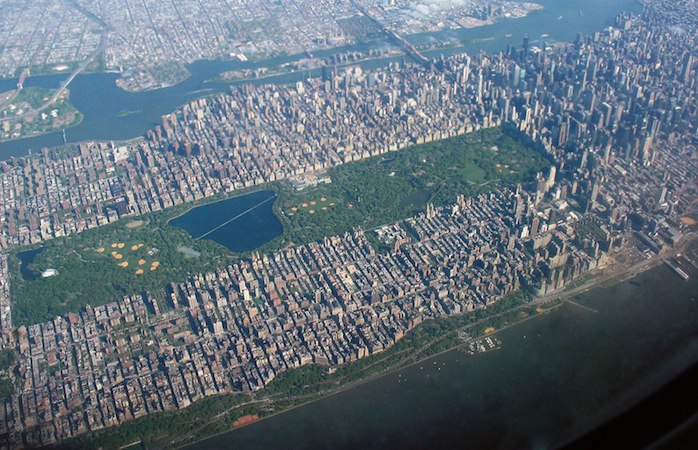 The Central Park Commissioners, as the governmental body was known, appointed Frederick Law Olmsted as superintendent of works and called for an open competition for a new design. Olmsted was not a designer or engineer. He had been a farmer and horticultural enthusiast on Staten Island for several years before traveling in northern Europe, Mexico, and elsewhere. His travels inspired him to take up writing and, later, magazine publishing. Calvert Vaux approached Olmsted about jointly submitting a design to the park competition. 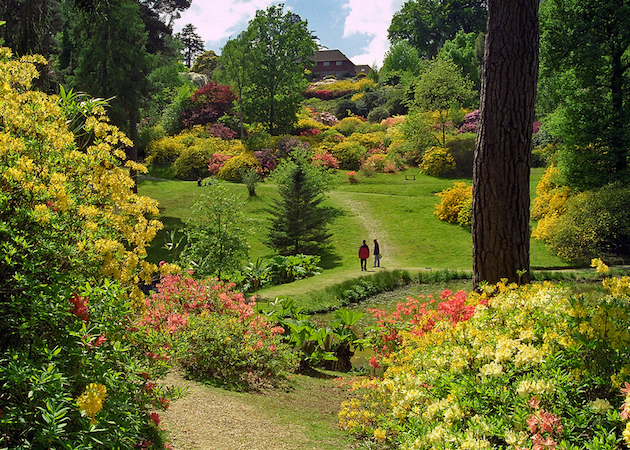 Vaux, an English architect, had earlier worked in partnership with Downing and eagerly took up the latter’s Romantic ideas about landscape. His partnership with Olmsted resulted in a pairing of like-minded, strong-willed individuals determined to mold the park to their shared vision. Olmsted and Vaux won the design competition with their “Greensward Plan,” the last of thirty-two to be submitted. Two elements distinguished the Greensward design from those of their competitors. One was the sheer allure of their landscape features, conveyed in twelve before-and-after panels included in their submission. The other was the ingenious separation of pedestrian and cross-park carriage (now vehicular) traffic. 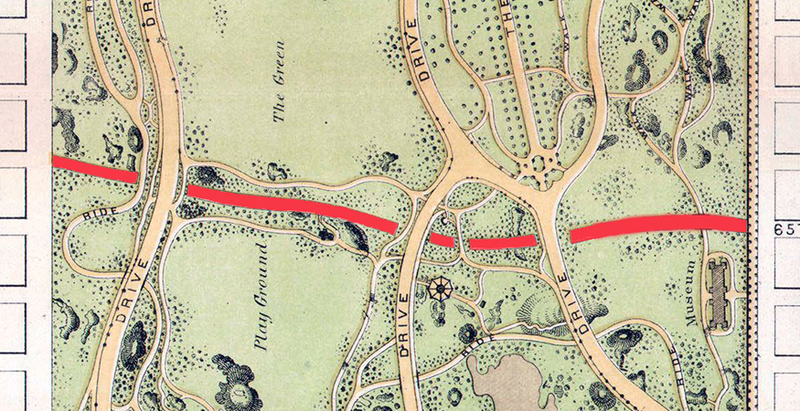 The competition brief had insisted that four roadways should connect the east and west sides of Manhattan through the park. All other submissions put those roads on the ground surface, effectively dividing the park into five zones separated by street traffic. However, Olmsted and Vaux submerged their “transverse” roads below ground level and created a continuous expanse of park differentiated by designed topography. As they discovered during construction, this critical invention gave them the chance to increase the park’s picturesque scenery since the many drives and walking paths that cross over the transverses and bridal paths could be embellished by attractive bridges. From south to north, the park is laid out to create distinct visual experiences, helping the visitor navigate the vast space and creating picturesque variety in strong contrast to the rectilinearity of the gridded city around it. South of the reservoirs—there were originally three but today only the largest irregular one remains as a lake—the park is a series of pastoral areas, including the large glade called the Parade Ground (now the Sheep Meadow) surrounded by copses or small groves of trees (above). In the southern end of the park, we find one area that departs from the naturalism: the long, tree- and bench-lined Promenade now know as the Mall (above) which leads to the Terrace and Bethesda Fountain (below). 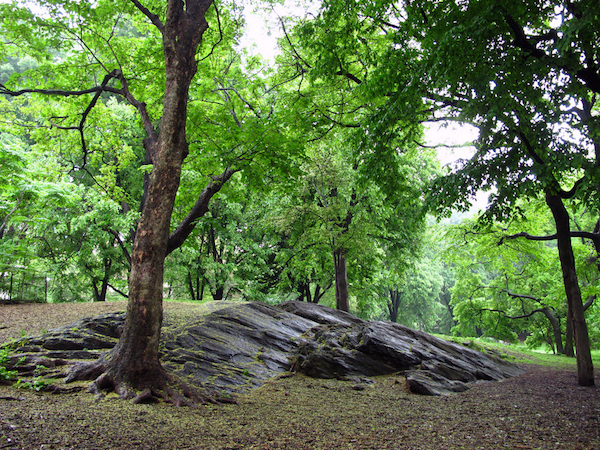 North of the Lake is the Ramble, a series of small, twisting paths along rocky outcroppings of the local stone, called schist, that can be seen throughout the park. At the northernmost edge of the park is the most rugged landscape with the densest foliage, then and now the park’s least visited section. 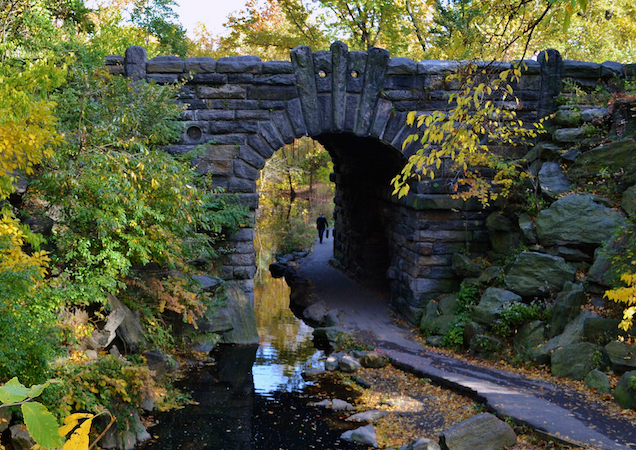 But the area offers some of the park’s most stunning features, including the Ravine with its small brook, waterfalls, and tomb-like Glen Span Arch, made from massive, rough-faced stones. The quiet of the area is an almost haunting experience; it feels much more secluded than its actual distance from the busy surrounding streets would suggest. 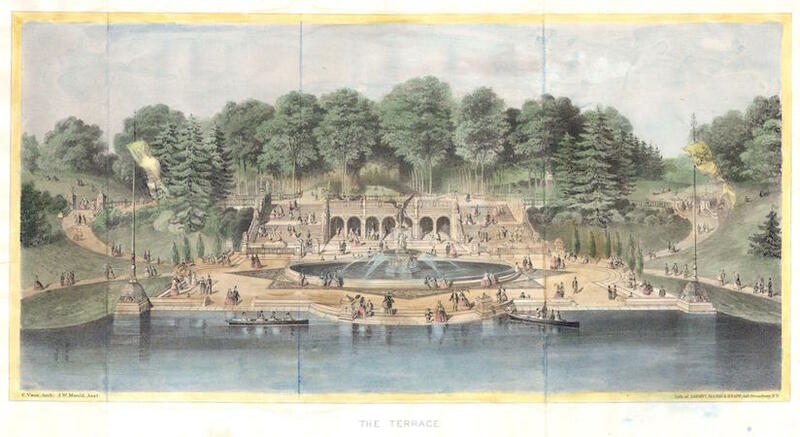 Central Park was very much a product of its particular moment in time, a combination of aesthetic ideas, urban concerns, and political will that coalesced in the decade before the Civil War. 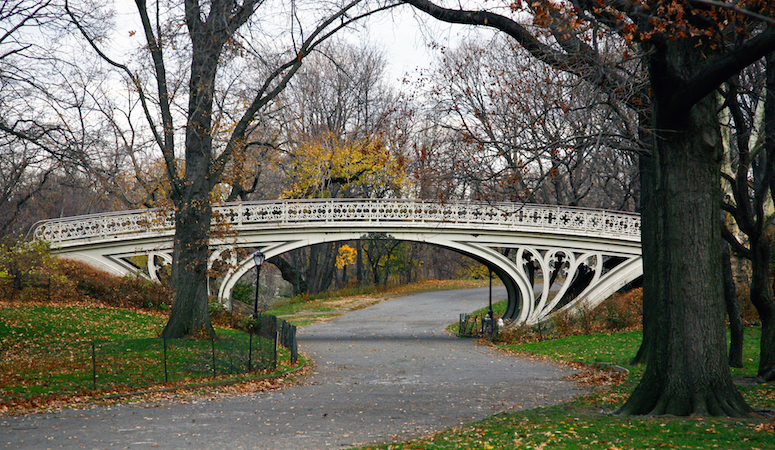 Its instant success led to other opportunities for Olmsted and Vaux to apply their approach to landscape design: a few of the important projects were Prospect Park in Brooklyn (1866-73), the Buffalo park system (begun 1868), and the suburb of Riverside, Illinois (1868). Later, working apart from Vaux, Olmsted had a flourishing practice: he designed the campus of Stanford University (1889), the Druid Hills district in Atlanta (1892), and the grounds of the World’s Columbian Exposition in Chicago (1893)—just three among many projects. The landscape philosophy developed by Olmsted and Vaux and first expressed at Central Park had lasting influence, inspiring, for instance, Jens Jensen’s “prairie landscapes” in Chicago and elsewhere in the early twentieth century. It was arguably no exaggeration when Harper’s Magazine declared in 1862 that Central Park was “the finest work of art ever executed in this country.” It may still be. Morrison H. Heckscher, Creating Central Park (New York: Metropolitan Museum of Art, 2008). Francis R. Kowsky, Country, Park & City: The Architecture and Life of Calvert Vaux (New York: Oxford University Press, 2003). Roy Rosenzweig and Elizabeth Blackmar, The Park and the People: A History of Central Park (Ithaca, NY: Cornell University Press, 1992). David Schuyler, The New Urban Landscape: The Redefinition of City Form in Nineteenth-Century America (Baltimore: Johns Hopkins University Press, 1986). Robert Twombly, ed. Frederick Law Olmsted: Essential Texts (New York: W. W. Norton, 2010). Cite this page as: Dr. Paul A. Ranogajec, "Olmsted and Vaux, Central Park," in Smarthistory, August 9, 2015, accessed April 20, 2019, https://smarthistory.org/olmsted-and-vaux-central-park/.